Frank Marshall Davis, the Communist Party USA member who mentored the young Barack Obama, was also the "security index". According to one of his pupils, far left author Alice Walker, Zinn shocked an audience from a local white college by declaring "Well, I stand to the left of Mao Zedong." - this at the height of the communist takeover of China. On April 28, 1966 Howard Zinn was a sponsor of the Herbert Aptheker Testimonial Dinner. The dinner was held on the occasion of Communist Party theoretician Herbert Aptheker's 50th birthday, the publication of his 20th book, and the 2nd anniversary of The American Institute for Marxist Studies. It was held in the Sutton Ballroom, The New York Hilton, Avenue of the Americas, 53rd to 54th Street, New York City. Most, if not all, of the event's sponsors came from the Communist Party's intellectual elite. By the 1980s Zinn had apparently switched his allegiance to another Marxist group. By the mid 1990s Zinn was mixing with ACORN, Democratic Socialists of America and the Communist Party breakaway group, Committees of Correspondence. With these people, Zinn was a founder of the radical New Party - later made famous by one of its most successful members, Barack Obama. On September 20, 2001 500 people gathered at the CUNY Graduate Center in New York City to remember the life of Democratic Socialists of America member Richard Cloward - originator of the infamous Cloward-Piven strategy, since utilized by sections of the US left to deliberately wreck the American economy. Speakers at the event included Cloward's widow Frances Fox Piven, Barbara Ehrenreich, Cornel West (later a member of Obama's Black Advisory Council), Gus Newport - (all members of Democratic Socialists of America) , New Party founder Joel Rogers, future Obama supporter and ACORN defender Miles Rapoport and Howard Zinn. In January 2002, a group of San Francisco leftists, mainly involved with Standing Together to Organize a Revolutionary Movement (STORM) or Committees of Correspondence and including future Obama "Green Jobs Czar" Van Jones, founded a national anti - Iraq War newspaper - War Times. 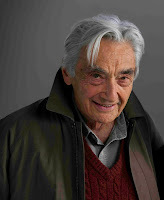 In 2004, Howard Zinn was one of 100 "prominent Americans" who signed an October 26 statement circulated by 911Truth.org calling on the US Government to investigate 9/11 as a possible "inside job". This is the same petition that got Van Jones into trouble in late 2009 - strangely, Jones' name at number 46, has been "removed by request". Fair enough, after all he was "tricked" into signing it. In the 2000s, Zinn was also listed as a sponsor of the Niebyl-Proctor Marxist Library in Oakland California, alongside Committees of Correspondence members and endorsers Herbert Aptheker, Anne Braden, Angela Davis, Ann Fagan Ginger, Jack Kurzweil and Maudelle Shirek, plus Communist Party supporters David Bacon, Gerald Horne and Cassandra Lopez and Herb Shore and from Democratic Socialists of America. In 2006 Howard Zinn was an original board member of Movement for a Democratic Society - an organization established to support the newly re-founded Students for a Democratic Society. Other MDS board members included former Weather Underground terrorist leaders Bernardine Dohrn, Mark Rudd and Jeff Jones, former Students for a Democratic Society leaders Tom Hayden, Carl Davidson (an Obama associate in the New Party and later) , Mike Klonsky, Bert Garskof and Mike James, former Obama associate Rashid Khalidi, Bill Fletcher, Jr., and Barbara Ehrenreich from Democratic Socialists of America, Gerald Horne from the Communist Party USA and Charlene Mitchell, Noam Chomsky and Angela Davis from Committees of Correspondence. Howard Zinn wrote more than 20 books, which included his 1980 best-selling and influential "A People's History of the United States". Movie star Matt Damon recently worked with Zinn to turn the book into a documentary for America's history students. Damon, who grew up next door to his idol, stated in Dec. 09 that one of his favorite books was A People's History of the United States by Howard Zinn, a book he first started reading in 1980 at the age of 10. No doubt Howard Zinn is currently being appropriately rewarded for his life's work. Yes, his works are force fed to American college students. I was one of the few people who read his stuff voluntarily. A People's History is drivel. It took me months to slug through it, but I did. I'm not at all surprised that he was a member of the Communist Party. Unfortunately, none of his fans will bat an eye. "So what?" they'll say. "What's wrong with being a memember of the CPUSA?" Then they'll accuse you of being a McCartyite. Being a member of the CPUSA is a badge of honor on campuses. This country was not founded by Marxists, for Marxists. This is not their country, they don't belong here. This country was founded by, and for, OURSELVES AND OUR POSTERITY alone. The constitutional "Posterity" of the founding generation is to whom this country rightfully belongs, the non-posterity minorities are here ipso-facto as a privilege through the 14th Amendment. This country was not founded for them, they are guests in the house of the "host" (government created "subjects"). Those that do not approve of our founding principles are free to leave, go to Cuba or N. Korea ,where things are done their way. No doubt the current occupant had plenty of Zinn books in his little satchel at Punahou, and under his arm at Colombia. God it's disturbing to think to what extent that embed had on the thinking of our citizens, brainwashing them from "age 10", as was the case with Matt Damon. Its impossible to swim in a sewer and not smell like sh*t...and BHO, his admin definitely has an odor. And it ain't the ashes of roses. The infection and poison of Communism -- and that "so what?" attitude our youth and our Academics have toward the CPUSA, Marx, Mao, etc. -- is a grave danger to our Republic. As Whittaker Chambers' asserted in his "Witness," the greatest problem with Communism does not center on economics but rather ATHEISM. Hi, my name is Jean Howell, and thought I would add my thoughts. I would like to first point out that Howard Zinn actually was always open about his politics, so to call him a liar is cowardly and incorrect. A number of his published works clearly show that he was an open marxist. So what!!!! Who is complaining about this? The same people who tout America and the great Capitalist Democracy where we have "Freedom of speech" Freedom of political idea", and so when someone actually exersizes these freedoms these are the people to ridicule them? How lame! Howard Zinn is an example of one of the finest citizens one could find. First he grew up poor and working class in this democratic America that the writers of this blog tout as so great, then he joins the military and puts his life on the line because he believed in fighting against something as horrible as fascism, then when he first hand witnesses the atrocities that his own goverment is willing to commit even when not necessary at all, he could just sit back, accept the lable of WW2 hero, and stay silent, but no! he follows his conscience. He studies history, he stands against injustice repeatidly whether it means getting arrested or being beat by police. Those who now want to stand and point their fingers and say "Communist!" don't exhibit the amount of integrity that Dr. Zinn had in his pinky toe. I hope that I can have a 10th of the positive impact in my life time that Dr. Zinn had in his. Since the America Speaks thing on the history channel, I don't give my bad capitalist dollars to those who starred in it! I wouldn't want them to feel guilty for earning $ by trashing America! Ridicule is part of our Freedom of speach! He can spout his failing ideas, and we can criticize them. Communists are still a danger in America and if he's your example of the finest citizens of the United States, I fear for you! To Dr. Howell, if he's so virtuous, and chock full of integrity, why didn't he go and protest the atrocities of the communists on their home soil? He stayed in the U.S. to write and speak of that vile, genocidially murderous, and abject failure of an ideology. Of this he knew two things, he would have the freedom to do so in the U.S., and he would live a much fuller, healthier,longer, and finacially secure life in America than he ever would have in the U.S.S.R.. Do you think that he was the only one to grow up poor and working class? My father came here after dealing w/the nazis,& the fascists, along w/ the allies leveling his town trying to liberate it, @ 15 yrs. old, w/no money, 2 suitcases, or knowledge of the English language. He and my mother raised 5 successful children, and he retired from a Fortune 500 company. This is the only country in this world, where if you had the wherewithal, work ethic, and determination, the odds are better here than anywhere that you could make something of yourself. Including, writing and teaching of the "benefits" of an socio/poli/economic ideology as horrible as communism is. I think Thomas Sowell summed it up best, "socialism in general has a record of failure so blatant that even an 'intellectual' could ignor or evade it." The very nature of membership in the CPUSA is lies and deception. While teaching in public places, the line is to denigrate capitalism, accuse America and preach socialism. In private, among cells or fellow travelers, the line is to plan the destruction of America by tearing down every pillar of society that holds it up: family, economy, cultural morals, loyalty to country, religion; and all this under orders from an enemy foreign power, the international communist party controlling all the lives of those who sell themselves into slavery to its madness. For all the 'good' you say Zinn did, I'll show you millions of bloody corpses sacrificed on the altar of communism. Not funny.